Thanks everyone for the nice comments about the Burlap Panel. That was really a fun project to create and a great way to use up leftover embellishments! I used a Collage Glue stick to cover a piece of Grungeboard with Merriment paper, then ran it through the Vagabond machine using the Vintage Cabinet Card die. I needed the shape to be a bit smaller to fit on the card front so I cut off about 1/4" off each side. If I had planned better, I would have just made the card wider but that part was already done so I just went with it. I used the Sizzix sized ovals to cut the Mirrored product for the center. If you missed the technique I used to age the Mirrored product, you can check it out here. Once the oval was complete, I peeled off the backing and adhered it to the foundation. Next step, coloring the new Industrious Borders with Alcohol Ink - gold. The borders are not flexible, so once colored, I clipped (only part of the way) between each point to make is flexible enough to go around the Sized Oval. Once that was complete, I added the Remnant Rub - Merry Christmas to the center. I should mention the bow and Baubles before I finish up. The bow is made from the new Linen trimmings. It comes narrow in the package but can be stretched to create a bigger bow. See the difference in the band wrapped around the cabinet card and the bow itself? Two different sizes. It can also be stained whatever color you wish. The holly is from the Sizzix decorative strip - Festive Greenery. I cut the leaves and scored the veins with the end of my Tonic scissors. The "berries" are a couple of sizes of pearl Baubles that have been colored with 3 different colors of Alcohol ink - butterscotch, red pepper, and mushroom. Once dry, I threaded the three Baubles onto a string to hold them tight, then glued them to the card with a bit of Glossy Accents. On the inside, I used more Merriment paper stash (kids in the snow), pieces from the festive greenery die, a vial label and more Remnant Rubs. that's it for today...don't forget to comment to win for Saturdays prizes! 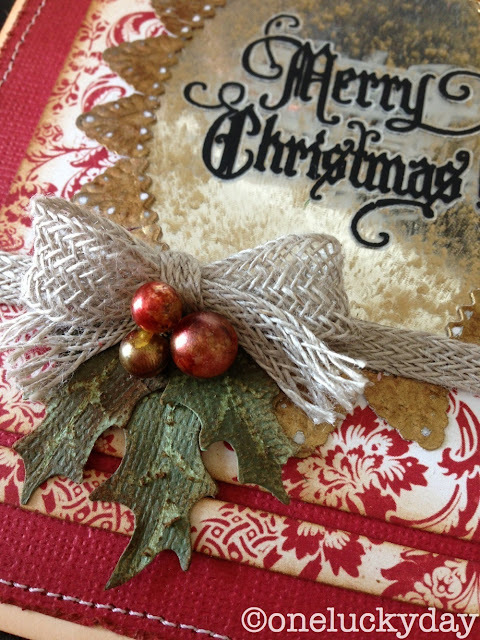 Your card is amazing, I love any details of it and how you used all the christmas products! Thank you for sharing! I love how you made the industrious borders flexible! I'd never have thought of that - thanks for the tip! Do you want my address now so you can have it ready to go in the mail well before Christmas? lol That is one pretty card! Oh my gosh I love this style of yours Paula...it's your signiture and those industrial remnants.....can't wait to get my hands on those! So beautiful - I can't wait to get my hands on those borders. Very pretty! You sold me on the borders because of the closeups on your projects!! Gorgeous! Can't wait to get these products! That paper stash- I die! I'm so excited - I have NEARLY everything to make this card - dies, embellies, except the industrious borders (BIG :-(...) because those are going to be AWESOME! (once they are in my hot little hands!) 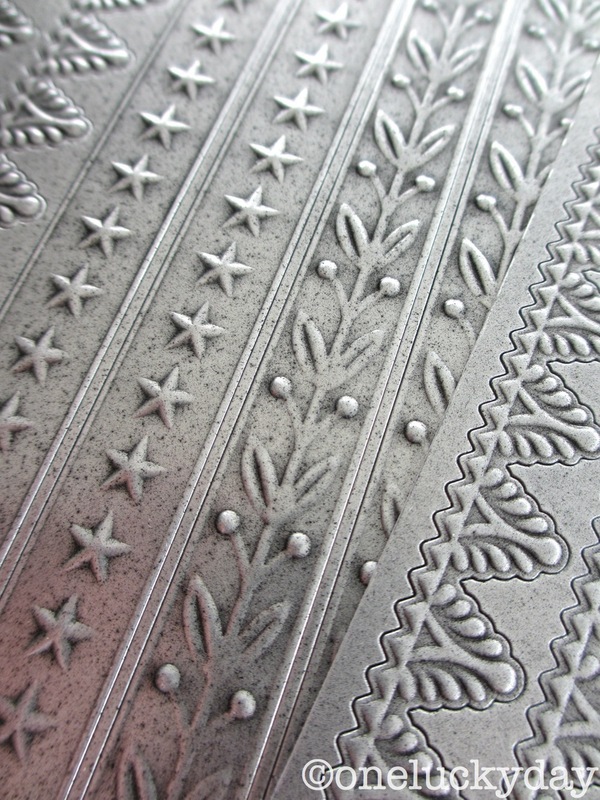 They remind me of the German silvered paper embellishments (can't remember what they are called) - so beautiful~! Another fabulous creation!!! Love this so much! 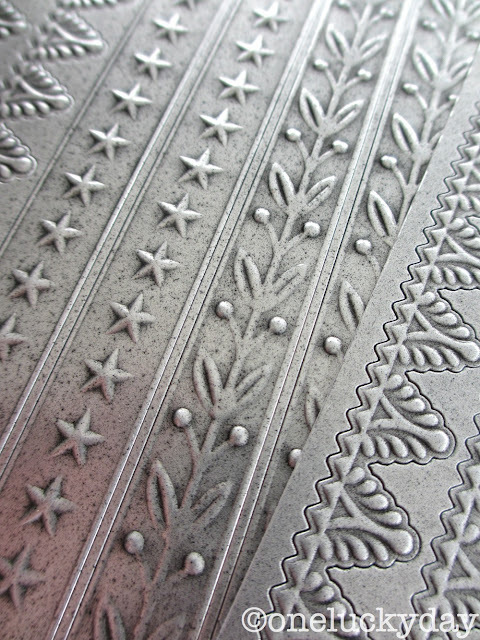 It's amazing how much I drool over the boarders and new trims once I see them in action! Beautiful - and the AI effect on the mirror is awesome! Another great project. I love the look of the mirror! I LOVE that Mirrored piece! And using the Industrial Borders like that is just ingenious!!! Gorgeous. I tried the Mirrored Patina but forgot you used the gold...I used some wacky combo of colors and it looked Blech-lucky for me I did it on the plastic liner-No Harm No Foul except to my ego. Wonderful creation! I love those borders and the Christmas papers are so beautiful!! Gorgeous card. Looks like my shopping list is going to get longer! Ha ha, I'm glad I'm not the only one who does that "I just went with it." I think sometimes winging it is the fun part. Have a great day! Can you pleeeeeeze come make my christmas cards?! That is just beautiful! Another gorgeous project! Thanks for all the wonderful ideas and the introduction to new products. I can't wait for Christmas! How pretty! I'd be tickled pink if that showed up in my mailbox at Christmas time. Fantastic card - it is just beautiful! Now you have me not only in the mood for the new releases, but for Christmas as well! Beautiful card and such lovely work! What a beautiful card! I have to go back again to try to absorb it all. What great ideas and inspiration...thank you! Every time I get an email saying there's a new post to your blog, I wait until I can find a quiet moment, maybe with a cup of coffee in my favorite reading chair snuggled up with m iPad. It's like Christmas morning for me when I was a child! Excitement, wonder and anticipation!! Know that your posts bring me such inspiration and delight and they are my reward at the end of a long day many times!! Can't think of anything better frankly!! I'm loving the music notes stamp, or is it a rub? 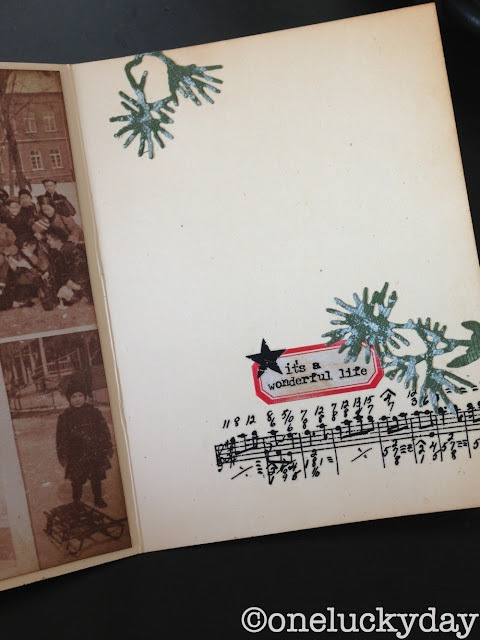 Anyway, I have a weakness for music notes stamps. Gorgeous! Love the mirror, and the simple inside is perfection!!! Awesome! Love the inside decor too. This looks beautiful! I love the industrial trim. Can't wait for that! 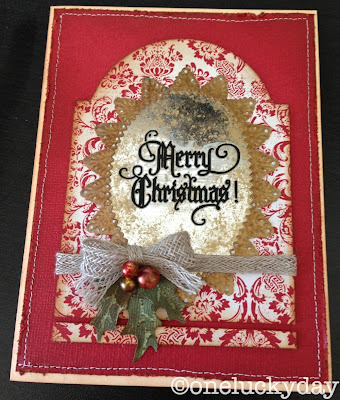 I was only thinking this week that I had better start thinking about Christmas cards, if I needed inspiration then I have got it right here with this beautiful Vintage creation.....it melts my heart, it is so gorgeous. I am so excited for the Christmas stuff...your creations have wet my appetite...and all the CHA pictures were fantabulous...beautiful job!! This is gorgeous, Paula! I love those new Industial Borders. You keep amazing me with your projects. I love this too. Shall I send you my adress, so that I can get this drooping christmascard, hahaha! Fabulous card! I love the details. Thanks so much for sharing how you created it! The card looks wonderful. I like how you cut the strip from the bottom and separated it to create the little reds strip. Beautiful card Paula! Thanks for sharing. Fantastic card- I love those borders! I love your holly/leaf cluster! So vintage looking...much better than the fake looking plastic ones! I've got the pearls, alcohol ink and die, so I'm all set! BTW, the whole card is wonderful! Awesome card! Thanks or the chance to win something awesome...but mostly, thanks for sharing all your cool ideas! WOW ... I just love this card. Your work is so inspirational - keep feeding us! Gorgeous - the industrious borders are amazing, and that holly is just lovely! 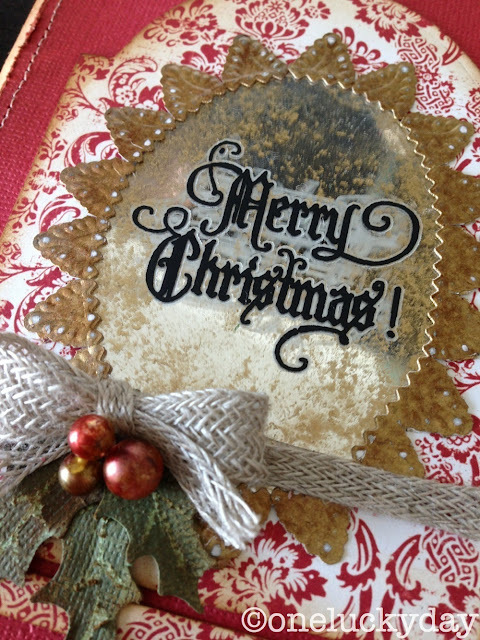 WOW- just love the card and thank you so much for the tutorial. I LOVE LOVE LOVE the ageing on the mirrored piece. Thank you for a chance to win and for sharing. Beautiful card, and as always... your work is awesome. I am a newcomer to your blog. I found you just about a month ago, but have been very inspired from the beginning. I am catching up on your past projects as well and am in love. Keep up the beautiful work and thanks for sharing! beautiful as usual and excellent tutorial. looking forward to the next post. Such beautiful work! You are so inspiring! I can hardly wait for all the new CHA products to get here!! Neat card. Loving the borders and mirrored products. The card is beautiful and I love the burlap panel. Thanks for sharing your work and for the chance to win! Paula, I love this card so much! It's vintage and beautiful! Thank you for always inspiring me!! love the industrious borders. the way you used them makes them look like silver german scrap. I love the pearl baubles! I will definitely "borrow" that idea. Time to get started on the Christmas cards! Gorgeous card Paula. Love how you antique everything - thanks for showing us how. fabulous! love those flexi boarders! Love the card...love everything you make. The card is BEAUTIFUL! I love the Industrious Border. Clipping it is such a great idea! Beautiful! I love the mirror in the center! Beautiful card. Love how the mirror looks so very vintage, and the inside of the card. a true vintage flavor to this card. I love it. tfs. Love this card and the borders are too tempting ... they are now a must have! Gorgeous and would be a very happy recipient that gets this card! I really like this card and the mirror an border is fantastic!!! This is so clever - I love how you did the borders! Wow! Love what you did the the Industrious Borders. Looking forward to getting my hands on those. .... and love the trick with the mirror. Another great card! Good to know you can manipulate the industrious borders! So glad you showed the interior of the card. I'm guilty of not doing much there but now you've inspired me with your great ideas. 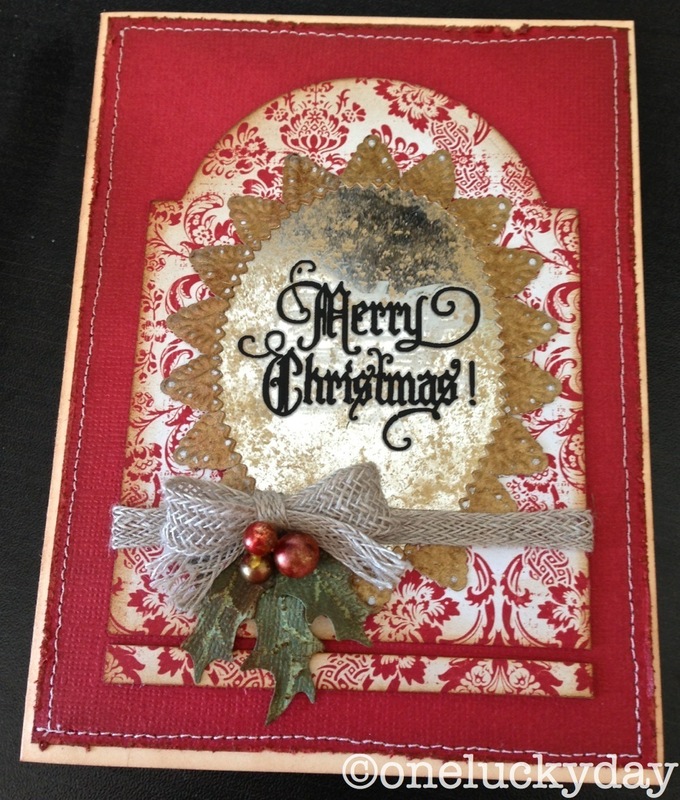 A beautiful vintage Christmas card! Thanks for including the link to your tutorial for aging the moirrored paper. Is this the beautiful card that Tim showed on the CHA video when he said you could use the remnant rubs on mirror? In any case, it is absolutely lovely. I am enjoying seeing how you have used so many of the newly released products, and you are getting me in the mood for Christmas as well. . . Lol! All the products you use look like so much fun. What a treat it would be to win a tote! Thanks for the chance. Beautiful card. Love the vintage mirrored sheets. Love the baubles and rich red color also. Thanks for the giveaway.